OK that is all for our coverage of Friday's practice in what was another Mercedes dominated day. Nico Rosberg topped first practice, with his team-mate Lewis Hamilton going fastest of all in the afternoon. second practice report to read and join us again tomorrow morning to find out who will have the edge. "Sebastian Vettel says it is 'inevitable' he will have to take a penalty for using an extra engine this season. 'The question is how many'". Vettel did not take part in second practice as Red Bull changed his car's power unit. Interestingly, Nico Rosberg has never qualified in the top three in seven visits to Spa. He has also never finished on the podium, whereas Lewis Hamilton won the race in 2010. The good news for both drivers, though, is that the last time a Mercedes car failed to finish a Belgian Grand Prix was in 1955. So what do we take from that second practice session? It is tough to call who has the edge between Lewis Hamilton and Nico Rosberg for qualifying tomorrow. There was very little to separate the two on the long runs, both lapping around 1:54 or 1:55 but Hamilton looked very fast over one lap. It is certainly going to be close. Lotus have provided an update on Pastor Maldonado, confirming he was taken to the medical centre for precautionary checks and that he is OK.
courtesy of Pedro de la Rosa. Lewis Hamilton finished over half-a-second quicker than his team-mate, and title rival, Nico Rosberg. A sense of deja vu seeing Lewis Hamilton top second practice? That will be because there have only been two race weekends where he has not finished fastest in Friday practice. "That was a big crash for Pastor Maldonado. He's been taken to the hospital as a precautionary measure according to team." "Mercedes are looking very strong but is is going to be Ferrari right behind and a good battle with Williams as well. Daniel Ricciardo needs to have a very good qualifying if he is to be in the mix on Sunday." MERCEDES' LEWIS HAMILTON FINISHES FASTEST IN SECOND PRACTICE FOR THE BELGIAN GRAND PRIX. BBC pit-lane reporter Tom Clarkson: "All quiet on Seb's side of the garage during FP2. It never rains for him, it pours." Valtteri Bottas is lapping in and around 1:56 on the medium tyre and his 13th lap on that compound sees him round in 1:56.513. Williams confirm he and Felipe Massa will finish the session with some practice stops. Into the last seven minutes of second practice and still the Mercedes duo of Lewis Hamilton and Nico Rosberg lead the way. Fernando Alonso is third fastest, Felipe Massa fourth, Jenson Button fifth and Valtteri Bottas sixth. Lewis Hamilton, still the pacesetter with 1:49:189, is told over team radio that he is "half a tenth faster" than team-mate Nico Rosberg on his last lap. That came after Mercedes executive director Toto Wolff gave some interesting insight into the team's thinking after Hamilton's failure to follow team orders in Hungary. Wolff says the situation "needed a little bit of mediating, management, caressing, hard words", adding: "You cannot expect it to run super-smoothly. You don't expect when your team-mate has one more stop to do that you make his life difficult. On the other hand you cannot ruin one's race by expecting him to lose a couple of hundred metres. It was a matter of the words used not the principle. "We probably shouldn't have said to Nico that Lewis was going to let him through, we should have said he won't make your life difficult." A bit of sunshine is peaking through the clouds and it does indeed look as though this session will remain dry. A slightly nervy moment for Nico Hulkenberg as he briefly loses the rear of his Force India through Eau Rouge. He keeps it together though and continues on his way to clocking 1:57.313. "I watched all the cars at Eau Rouge this morning. The plank scrapes across the tarmac and the Marussias and Jenson Button's McLaren were doing that a lot whereas the Mercedes were fine through there." Sparks flying as Max Chilton takes his Marussia through Eau Rouge while Lewis Hamilton does a practice start at the pit exit. McLaren: Kevin Magnussen fires up. Blankets come off and he's out on the Option tyre as well. Daniel Ricciardo is out on the option tyres but his first effort is not a strong lap as he clocks 1:50.977 - eighth fastest. He lost a little bit with a wobble coming out of Turn Nine. With 40 minutes remaining Lewis Hamilton leads ahead of Nico Rosberg, Fernando Alonso, Felipe Massa and Jenson Button. Almost all drivers have made the switch to the soft tyres, Daniel Ricciardo and Kimi Raikkonen being two of the few who are still to make the switch. Romain Grosjean reports over team radio that his Lotus' rear end "is all over the place", no such concerns for Nico Rosberg as he sweeps around the circuit to clock the fastest time of the day with 1:49.793. Lewis Hamilton is having none of that from his Mercedes team-mate though and he embarks on a faultless lap to go even faster with 1:49.189. Rachel Bridge: So exciting to see both McLaren cars putting in fast lap times today. Looking good for Sunday. BBC pit-lane reporter Jennie Gow has just grabbed a word with Red Bull adviser Helmut Marko, and asks about the decision to choose 16-year-old Max Verstappen for Toro Rosso next season. "We watched him for a while and had discussion for a while," he said. "Going from go-karts straight away into F3 and being immediately competitive was one thing but then there were some races, like Norisring when it was completely wet and he was something like two seconds faster than anyone else. "That was something completely impressive and we decided we had to get him. He is young in age but he has been racing since four years old so he is very experienced. We expect an exciting year with him and Daniil Kvyat and I think we will see a similar performance, where he is immediately competitive." McLaren pair Kevin Magnussen and Jenson Button have changed boots, strapping on the soft tyres and Magnussen goes quickest with 1:51.074, only to be knocked off by his team-mate soon after as the Briton clocks 1:50.659. Sauber: Esteban spun and could not drive the car back into the garage, team will investigate. We are up and running again with 53 minutes left on the clock. As we wait for the session to get back under way, Jos Verstappen spoke to the BBC about his son Max who, at 17, will become the youngest Formula 1 driver in history when he makes his debut next season. Jos, 42, drove over 100 Formula 1 races, making the podium twice, and he believes his son has the potential to be "a lot better" than him. "He is complete. He can keep his head cool in certain circumstances," Verstappen Sr said. "People grow up faster [these days], the world is moving quicker and that is why I think it is possible [for him to race at his age]." Esteban Guttierez is currently strolling along a quite scenic path, lined by tall trees, at the edge of the circuit as he makes his way back to the Sauber garage. The recovery truck is on the scene to take away Gutierrez's car. The red flag is waved for the second time in this session as Esteban Gutierrez is stationery at Blanchimont, his Sauber pointing the wrong way. "Can you get back to the garage," Guttierez is asked over the radio. "It is the gear box. Something break completely," is the reply. Fernando Alonso clocks 1:51.693 to go fastest but Lewis Hamilton soon regains FP1 as he shaves half-a-second off Alonso's best. Daniel Ricciardo, Red Bull's sole representative for second practice with Sebastian Vettel twiddling his thumbs in the team garage as the power unit on his car is changed, runs off the circuit but is back on with no major fuss. Mercedes: First flyers complete - Nico Rosberg heads for the top, only to be toppled immediately by Lewis Hamilton! Less than a tenth in it! Personal bests in sectors one and three sees Jenson Button go fastest with 1:52.285. 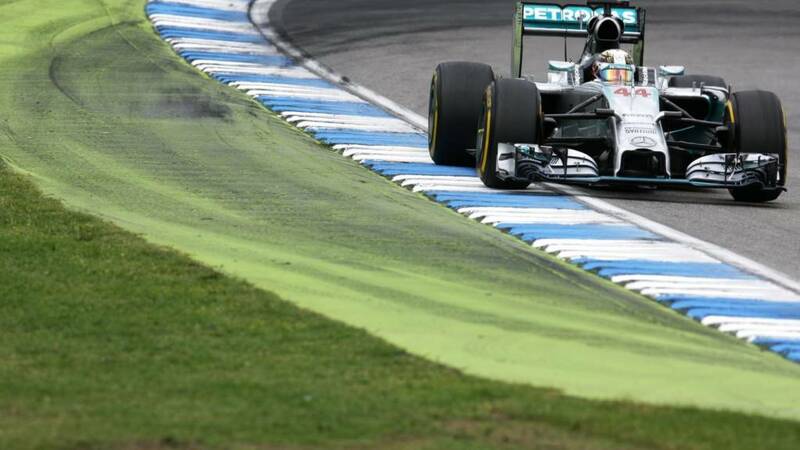 He is soon sent tumbling down the timesheet as Lewis Hamilton, Nico Rosberg and Felipe Massa all go faster. Hamilton's 1:51.989 is the benchmark time at the moment. Edson Charikinya: Maldonado seems prone to accidents, how many times has he crashed during practice this year? James Brandon: 'Practice stopped as Pastor Maldonado crashes' Pretty sure this is a pre-cursor to every weekend. Pastor Maldonado's stricken Lotus has been loaded up and lifted away and the remnants from his crash removed from the circuit. Second practice is back under way. It is not immediately clear what caused the crash, although Allan McNish speculates he may have been distracted when looking at his steering wheel buttons. BBC weather reporter Ian Fergusson: "FP2 1310 BST Despite ominous skies, nearest light showers currently missing circuit with none immediately threatening." Three timed laps had been set before the red flag stoppage, with Kevin Magnussen leading the way with 1:52.677, ahead of Jules Bianchi (1:54.509) and Andre Lotterer (1:56.720). Max Chilton has also been out on the circuit. Issues with Marussia prevented him from running in the first session, but they have now been resolved. The session is red flagged as Pastor Maldonado loses control of his car on the way down to Pouhon and hits the barriers. He is quickly on team radio to report he is OK though. BBC pit-lane reporter Tom Clarkson has just grabbed a word with Red Bull team principal Christian Horner, who explains Sebastian Vettel's power-unit change: "We have to change the engine unfortunately. There was an electrical issue in the first session which has caused quite a bit of damage. Unfortunately the length it takes to change the power units means there is no chance he will get out in this session. "It is a big shame because Sebastian's luck is not going his way in terms of getting track time at the moment." That black cloud that was on the horizon has swiftly positioned itself above the circuit and the skies are looking very ominous indeed. Lotus tweet that it might rain. We shall see. The track is open and the 90 minutes are ticking down as second practice gets under way. No-one heading out yet with a few teams carrying out a few more adjustments. Just as we get that disappointing news for Sebastian Vettel a black cloud appears on the horizon at Spa. Arriving especially for the luckless Red Bull driver? BBC F1 pit-lane reporter Tom Clarkson: "We're seeing a power-unit change for Sebastian Vettel. He did just 11 laps before reporting an exhaust problem so they are changing that engine. The record for that is three-and-a-half hours so he is going nowhere this afternoon. It's a problem for him because this circuit is all about confidence and he is losing that time now." BBC F1 pit-lane reporter Tom Clarkson: "It's great to be at Spa re-starting the season after the summer break. The weather forecast before coming was a bit iffy, but while we are expecting some rain for Saturday, it's dry on Friday and quite pleasant. The wind has picked up this afternoon, though, and that will make life difficult for the drivers in the long corners here. "I don't think the first session told us much about the form of the relative drivers and cars but this second session will be much more instructive, with qualifying runs due about halfway through and the race-simulation laps." BBC chief sports correspondent Dan Roan caught up with Bernie Ecclestone at Spa earlier today, with the Formula 1 chief saying he wants to run the sport for "as long as I can" after paying £60m to end his three-month bribery trial. his first major interview since he avoided a possible 10-year prison sentence, Ecclestone, 83, said he always believed he would walk away a free man. "I'm not scared of anything to be honest with you", he said. "It never bothered me because I knew I was innocent. I was never bothered about the jail sentence because I was sure it wouldn't happen. The system in law is pretty fair. Every now and again they get things wrong but normally, unless there's some political motive, it's all ok."
After polishing off those cakes, you can hear from Jennie Gow and the rest of the BBC F1 team when live video and audio coverage for second practice gets under way at 12:55 BST on BBC Two and 5 live sports extra. Live video will also appear at the top of this page at the same time. "Aside from the situations at Caterham and Marussia, the other driver news of the summer break was the decision by Red Bull to sign 16-year-old Dutchman Max Verstappen, who had not previously been a member of their junior team, and give him a race seat at Toro Rosso for 2015.
has caused a bit of a stir - Verstappen has only half a season of car racing behind him, even if he is a world karting champion. And the unanswered question so far is, what's the rush? Verstappen has never driven an F1 car and Red Bull have other promising young drivers on their books at much more advanced stages in their careers. So far, there is no firm answer to that one, but plenty of interesting gossip behind the scenes." Driver line-ups has been the main topic of chat this week, in particular with regards to a new face on the grid next season as Toro Rosso signed up 16-year-old Max Verstappen to race for them in 2015. The son of ex-F1 driver Jos Verstappen, who turns 17 in September, is a former karting world champion and currently competes in Formula 3. He is not yet old enough to hold a regular driving license, but he will become the youngest driver in Formula 1 history next year. Is it too young for him to enter F1, or is it a case of if you are good enough, you are old enough? Lewis Hamilton cooled down from the first practice session by taking the ice bucket challenge following his nomination by Red Bull's Daniel Ricciardo. The rest of the grid was safe, though, when the Briton made his nominations - actors Tom Cruise and Will Smith were among the four he chose. It was a largely trouble-free first session for Mercedes this morning and recent history suggests they will dominate again this afternoon, with Lewis Hamilton having had the better of his team-mate in FP2 at the last five races. Hello! Welcome back to coverage of practice for the Belgian Grand Prix, with the second session set to get under way in 30 minutes. We may have had a few weeks off since the last race weekend but evidently little changes as Mercedes topped the timesheet, with Nico Rosberg fastest in FP1 ahead of Lewis Hamilton. More of the same in FP2? OK it is time to put the brakes on this live text, but don't wander off too far as we will be back up and running at 12:30 BST for second practice. McLaren: Debrief session is underway, and it's time for a quick bite! See you soon for this afternoon's FP2. "The prospect of a Williams winning a race in 2014 seemed absurd in the midst of their struggles last season, but has become a credible possibility after their strong performance so far this season. The belief in the paddock is that this race and the next one in Monza could see them as genuine challengers to Mercedes. "That is based in their car's strong straight-line speed, a function of their car's low drag and the strong Mercedes engine. Lewis Hamilton said his engineers had 'suggested Williams are going to be close'. But Mercedes will be tough to beat - their car has more downforce, which will be a benefit in the middle sector of the lap, and the same engine. Can Williams make the next step?"" Around a circuit such as Spa, you would expect Williams to be Mercedes' main challenger this weekend, although Valtteri Bottas and Felipe Massa were considerably off the pace in that session. Bottas was 10th fastest, more than 1.5 seconds down on Nico Rosberg, while Massa was 15th. There is a familiar face in Belgium today, with Bernie Ecclestone back in the Formula 1 paddock for the first time since the settlement of his Munich court case. He was quizzed by journalists about October's Russian Grand Prix, which got the green light to go ahead earlier this week. "We have a contract," he says. "Our friends there are happy with the contract, we are happy. We will be there. If people have arguments with Russia, maybe they have, but we haven't got any." Marussia said on Thursday that Chilton, 23, would be replaced for the weekend by reserve driver Alexander Rossi as a result of "contractual issues". The team refused to give details but on Friday morning Marussia said Briton Chilton would be racing in Spa. Lotus: See you soon for FP2! Another Mercedes dominated first practice, with this one-two their fifth in succession. Nico Rosberg topped the timesheet with 1:51.577, completing 25 laps, while Lewis Hamilton's best lap time was 1:51.674 from his 24 laps. MERCEDES' NICO ROSBERG IS FASTEST IN FIRST PRACTICE FOR THE BELGIAN GRAND PRIX. So as we head into the final minute, it is Nico Rosberg who leads the way ahead of Lewis Hamilton, Fernando Alonso, Jenson Button and Kimi Raikkonen. With just a couple of minutes of left it looks like Sebastian Vettel's running is over. He is back in the Red Bull garage and out of his car and the mechanics are straight over to have a look at it. Lewis Hamilton has a fair old wobble through Eau Rouge, losing his rear end but keeping it together superbly to avoid the barriers. Meanwhile, some concern for Caterham's Giedo van der Garde, who is down in 17th, as he exclaims over team radio: "The power is not correct." Caterham F1: Both cars back in the garage after another run. Suppose you've spotted our new nose already, right? Kimi Raikkonen heads back out with Ferrari reporting his car is ok after that earlier concern about temperature problems. Raikkonen has the fifth fastest time of the session so far. A lull in on-track activity with all but Sergio Perez, Nico Hulkenberg and Giedo van der Garde in the pits as we enter the final quarter-of-an-hour. Fernando Alonso may be ruling out a win at Spa but history is on his team-mate Kimi Raikkonen's side, with the Finn having won the Belgian Grand Prix on four previous occasions. "Fresh from the summer break, and with memories of his brilliant drive to second place in Hungary still fresh, Fernando Alonso is expecting a tough couple of races in Belgium and Italy to start off the second half of the season. Ferrari, he is well aware, will suffer for their lack of engine power on the long straights of Spa and Monza. "He dismissed thoughts of winning a race before the end of the season, saying: 'Honestly, I think our target has to be lower. It has to be fighting for the constructors' championship in the highest position possible. But it is quite a big competition, a tough competition, with Williams. The next two races are quite good for them, so we expect to have tough weekends at the moment against Williams here and in Monza, and we need to cope with that. We need damage limitation in the next two races in terms of points, and then attack in the last part [of the season]. I think a grand prix win this year is a little bit unrealistic.'" Kimi Raikkonen spins at La Source but has little trouble recovering and is back under way in his Ferrari. He then reports some temperature problems over team radio and carefully makes his way back into the pitlane. No such concerns for his team-mate Fernando Alonso though, who is still third fastest, behind the Mercedes pair of Lewis Hamilton and Nico Rosberg. Nigel Moss: [Re: 09:49 entry] Rumour has it that a bucket of iced water has been nominated to have Kimi Raikkonen tipped into it. Into the final 30 minutes of this session with Nico Rosberg fastest, ahead of Lewis Hamilton, Fernando Alonso, Jenson Button and Kimi Raikkonen. No major drama for any of the cars out on the circuit so far today. The sweeping Pouhon corner is proving a little troublesome for a couple of the drivers as Sebastian Vettel runs wide there before Lewis Hamilton does exactly the same soon after. Hamilton loses P1 to team-mate Nico Rosberg, who is round in 1:51.577, before the former is told over team radio that Rosberg gains on him in the final chicane and Turn 10. Williams on Twitter: "Pitwall not the simplest to access here....watching Rob Smedley scale the fence to climb in just now was interesting!" WelshRacer: "Max, Rossi, Max, Rossi #bbcf1 shake it all about." Nico Rosberg is back out on the circuit having just had some adjustments made to his helmet. Meanwhile, his Mercedes team-mate Lewis Hamilton is flying round the circuit, clocking personal bests on S1 and S2 on his way to going fastest of all with 1:51.674. A spin for Marcus Ericsson at La Source but he recovers with minimal fuss. His Caterham team-mate Andre Lotterer is a shade faster than him on the circuit at the moment, having clocked 1:57.886. Christian Horner, by the way, was nominated by Daniel Ricciardo to take the ice bucket challenge - the charity fundraising activity which has gone viral - after the Red Bull driver did it himself yesterday. If there is one man who can keep smiling and giving the thumbs up while being showered in ice, it is Ricciardo. Surely only a matter of item before THE iceman, Kimi Raikkonen, receives his nomination? BBC F1 pit-lane reporter Lee McKenzie has just grabbed a word with Red Bull team principal Christian Horner, who says: "Everyone has come back from the break relaxed and recharged and ready for the races ahead. "It was the best way possible to sign off for Daniel with the win in Hungary. The challenge now is that this circuit is very different, so it will be an interesting weekend. "Sebastian has been plagued by bad luck but we have seen that his qualifying performances has stepped up a gear, he has found a balance with the car he likes and we should see Seb back to his best soon." Just under 45 minutes of the session remaining and once again the circuit falls into relative silence, with almost all drivers back in their garages assessing how the first hour has gone. Daniel Ricciardo, winner in Hungary last time out, has the 10th fastest time so far with 1:53.884, with his Red Bull team-mate Sebastian Vettel fifth fastest with 1:53.369. Marussia's Graeme Lowdon has taken time out to explain to BBC F1 commentator Ben Edwards the sudden change with regards to Max Chilton: "These things happen. It is the driver's job to be flexible and both Max and Alex are professional drivers and will take this in their stride. I is a reflection of how the industry has to work sometimes. "I can't go into too much detail but at the end of the day we are running an F1 team and there are a large number of commercial agreements interlinked and sometimes if for contractual reasons it is not appropriate for a driver to be in the car and we reached that stage. But circumstances change, Alex is our reserve driver and he is there to help the team and be there ready when instances like this happen." In case you missed it and are wondering what the situation with Max Chilton was on Thursday, here is a little recap. Marussia released a statement saying Alexander Rossi was taking his place this weekend because of unspecified 'contractual issues', but then Chilton put out a statement saying he had voluntarily stepped aside to allow the team 'to allow the team to attract much needed funds by selling his seat'. If, as it seems, that Chilton is back in the car this afternoon, then it would seem any issues have now been resolved. "Fernando Alonso apparently felt something on the engine than the gear box so he lifted off and stopped and had a little check to make sure he was ok to bring it back on. "Ferrari have taken the engine cover off the back and they are working around the car right now as Alonso gets out of his cockpit. I think he will be out for a minute of two." There are plenty of Fernando Alonso fans in Belgium and they will have been pleased to see him go to the top of the timesheet with 1:51.724. It is a brief stay, though, as Nico Rosberg goes fastest once again. Moments later, Alonso comes to a halt just ahead of Eau Rouge. Not too sure what happened there. "Rosberg refused to go into details on the issue and simply said he had 'learned various things from that race which I will try to adapt for the future'. He added: 'I gathered that there was a bit of a mess in the media and so it wouldn't be useful for me to give another extra bit to that at the moment, it's better to let it all calm down.' To which a mischievous Felipe Massa said: 'You fight after the race? With…?'" The timing board is lit up now with 18 drivers clocking their first timed laps. Championship leader Nico Rosberg goes fastest with 1:52.143. Nestled in the sumptuous Ardennes Forest, the 7.004km (4.4-mile) circuit is the longest - and one of the fastest - on the calendar. It was first used for racing in 1922, with the track measuring 14km (8.7 miles) on public roads, but was cut down to its current length in 1979. However, the drivers still record an average speed of over 140mph and, most importantly, the challenging Eau Rouge, Pouhon and Blanchimont corners remain. A brief moment of silence with all the cars back in their respective garages is broken as the McLaren pair of Kevin Magnussen and Jenson Button charge out. Both pop the first timed laps on the board as Magnussen is round in 1:53.405, with Button's first timed effort just under a second slower. BBC F1 commentator Ben Edwards reports some interesting news from Marussia - Max Chilton will be back in their car for this afternoon's second practice. Good news for Chilton, but spare a thought for poor Alexander Rossi. The 22-year-old American had got himself psyched up for this weekend, but may not make his race debut after all. Lewis Hamilton and Nico Rosberg have both had their first foray on to the circuit before heading back in. Both report no issues with their respective Mercedes. Just over 15 minutes into the session and no times on the board as yet. Aside from Andre Lotterer, there is another new face out on the circuit today, with Alexander Rossi stepping in for Max Chilton at Marussia. BBC pitlane reporter Tom Clarkson grabbed a word with him just before first practice, and Rossi said: "Things came about quite quickly and I think everyone was a little surprised but I am grateful for the opportunity. I heard about it late on Thursday, it is what I have worked for my whole life so I feel ready." Samuel Anson: Will Williams finally pull it out the bag and challenge for best of the rest after Mercedes?" Among the 13 drivers to have ventured out for their installation laps so far is Giedo van der Garde, who is taking part in first practice for Sauber, with Esteban Gutierrez back in the car for the rest of the weekend. Caterham F1: And off we go. Andre Lotterer drives out of the garage. FP1 is go! The track is open and Marcus Ericsson is the first man out on the circuit for Caterham, with Andre Lotterer swiftly following him to make his debut. Ferrari on Twitter: "Ready to go." Andre Lotterer competed in the British and German F3 series before being named Jaguar's F1 test driver in 2002. Born in Germany but brought up in Belgium, Lotterer moved to Japan in 2003 and went on to race in Formula Nippon and the Japanese Super GT Championship. He made his Le Mans 24 Hours debut in 2009 and claimed the overall victory in the race with Audi in 2011, 2012 and 2014. He has also competed in the World Endurance Championship since 2012. "He admitted Kobayashi was probably 'not so glad about the situation but when I was younger I also I had to watch other drivers take my seat or situations like this'." "Caterham's new recruit Andre Lotterer admitted he had been 'brave' to make his F1 debut with the struggling team, but felt unable to turn down the opportunity. He said team 'adviser' Colin Kolles 'always wanted to give me a chance in an F1 car and this is his best opportunity to do that'. The team said it hoped to benefit from the 32-year-old's experience. It seemed an odd remark given that Lotterer had not driven an F1 car since being Jaguar test driver in 2002, but then Kamui Kobayashi is not renowned for his technical expertise." This weekend's grand prix is live across the BBC, meaning you can tune in to watch the action from first practice at 08:55 BST on BBC Two while there is audio commentary on BBC Radio 5 live sports extra from the same time. Both are also available online, with video coverage at the top of this page. "Let's kick off with some driver news. There are two new faces making their debuts this weekend, and remarkably they are separated by a decade in age. Max Chilton has made way for Alexander Rossi, who at 22 becomes the first American to race in F1 since Scott Speed in 2007, again it seems just for this weekend. Both situations are rich with intrigue. More of which in a moment." Much like they do in American television shows when they have those annoying little mid-season breaks, how about a little recap of the year so far? Nico Rosberg and Lewis Hamilton are battling it out at the top of the drivers' championship with just 11 points separating the two Mercedes drivers. Rosberg has four race wins to his name, with Hamilton having five, but more consistent points scoring by the former means he leads the way heading into this weekend's race. having claimed victory at a thrilling Hungarian Grand Prix towards the end of last month. Hamilton finished third in that race, with Rosberg fourth. All caught up? Good. Then let's crack on with the latest episode in this thrilling season. "Just under four weeks after a Hungarian Grand Prix that ranks as one of the best for years, for the action on the track and the controversy off it, the Formula 1 teams and drivers kick off the second half of the season at the best possible venue. Spa-Francorchamps deserves its hallowed place in motorsport history, and the spectacular circuit, swooping up and down the hills and valleys of Belgium's Ardennes Forest, is always one of the highlights of the year. "Lewis Hamilton and Nico Roberg resume barely disguised hostilities in the championship. Williams could challenge strongly, there have been some fascinating developments to keep the interest high and the weather is predictably, er, unpredictable. What a weekend is in store." Hello and welcome to live coverage of first practice for the Belgian Grand Prix. Hungarian Grand Prix but four weeks have passed since that thriller, the summer is over and it is time to get back down to business. And what better place to kick off the second half of the season than at one of the sport's most iconic tracks - Spa Francorchamps. ...in the case of Lewis Hamilton and Nico Rosberg, that real world is the battle for the 2014 world championship.